On Sunday June 5 New York Governor Andrew Cuomo issued an executive order to penalize those who engage in political expression he doesn’t approve of. This move is unquestionably unconstitutional and was met with near instantaneous outcry from the civil liberties community. 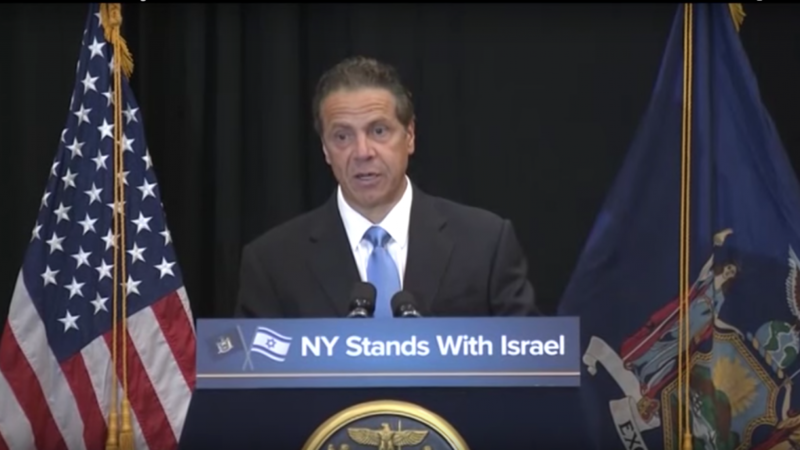 Cuomo’s executive order, EO 157, specifically singles out the Boycotts, Divestment, and Sanctions (BDS) movement, which nonviolently protests Israel’s human rights policies towards the Palestinian people. BORDC/DDF takes no position on Palestine/Israel, but we do support the right of people to organize boycotts and engage on both sides of this debate. I am signing an Executive Order that says very clearly we are against the BDS movement. If you boycott Israel, New York will boycott you. We have sent Governor Cuomo a letter outlining in great detail how EO 157 is unconstitutional and calling on him to rescind it. View our letter to Governor Cuomo here. Boycotts for political, social, and economic change are political speech; the Supreme Court has ruled as such. Cuomo should know this, as he recently committed the state of New York to the ongoing boycott of North Carolina due to their unconstitutional, discriminatory anti-LGBT bill. From a constitutional standpoint, there is little difference between either boycott. In the case of the North Carolina boycott, its aim is getting the state to repeal its anti-LGBT bill. In the case of BDS, its aim is getting Israel to cease its military occupation of territory outside its 1967 borders, grant Palestinians the right of return, and cease discrimination within Israel against Palestinians with Israeli citizenship. Regardless of what one thinks of these demands, they are certainly “political” and “social” change and are thus political speech. The difference, of course, is that Cuomo favors the aims of one boycott and opposes the other one. However, the First Amendment does not turn on the personal opinion of Cuomo or any other state official or entity. While we have been able to through grassroots organizing defeat some of these bills and in other cases cause them to be severely watered down, this is the first time we have seen the anti-BDS prohibitions removed from the legislative process and put solely in the hands of the executive. Cuomo is aware of this, as he wasted no time before declaring his executive order the first of its kind in nation. Through grassroots organizing, advocacy, and public pressure we plan to help ensure that has the distinction of not only being the first of its kind, but the last as well.